Disclaimer: this is an expanded version of a previous post – IBD Basics: Corticosteriods which will now cover how to take steroids, how they work within the digestive tract and how this affected when having a stoma. Corticosteroids are potent anti-inflammatory agents for moderate to severe relapses of both UC and CD. They have no role in maintenance therapy for either disease. They mimic the effects of hormones your body produces naturally in your adrenal glands, which sit on top of your kidneys. When prescribed in doses that exceed your body’s usual levels, corticosteroids suppress inflammation. This can reduce the signs and symptoms of inflammatory conditions, such as arthritis and asthma. However, corticosteroids also suppress your immune system, which can help control conditions in which your immune system mistakenly attacks its own tissues. How do they work in IBD? For active UC, the trials are all over 30 years old, but results are consistent. Oral prednisolone – starting at 40 mg daily – induced remission in 77% of 118 patients with mild to moderate disease within 2 weeks, compared with 48% treated with 8 g/day sulphasalazine. They also found that a combination of oral and rectal steroids is better than either alone. Adverse effects are significantly more frequent at a dose of 60 mg/day compared with 40 mg/day, without adding any benefit; so 40 mg appears optimal for outpatient management of acute UC. Too rapid reduction can be associated with early relapse and doses of prednisolone <15 mg/day are ineffective for active disease. For active CD, there have been two major trials that established corticosteroids as effective therapy for inducing remission in CD. These concluded that 92% remission within 7 weeks was achieved in 142 patients with moderately active Crohn’s given prednisolone 1 mg/kg/day with no tapering. And whilst Budesonide was slightly less effective than prednisolone, it is an appropriate alternative for active ileo-ascending colonic disease. Deciding to treat with steroids should be balanced against side effects, but a decisive on going treatment plan of active disease with a strategy for complete withdrawal of steroids is often appreciated by a patient suffering miserable symptoms. Regimens of steroid therapy vary between centres. How is this different when you have an Ostomy? Several factors can alter the absorption of drugs taken orally in patients with a compromised digestive system. The most important determinations are the length of bowel available for drug absorption, and which section of the bowel has been removed. The small bowel, with its large surface area and high blood flow, is the most important site of drug absorption. Therefore, the larger the amount of the small bowel that has been removed, the higher the risk that drug absorption will be affected. Factors such as the time it takes for food to empty from the gut – gastric emptying – and move along the intestinal tract – transit time – also then come into play. Due to these factors, people with ileostomies are at higher risk for sub-optimal drug absorption than people with distal colostomies. People who have had sections of their small bowel removed and do not have an ostomy are also at higher risk. For the ileostomy patient, dosage forms with quick dissolution – dissolving tablets – and absorption should be used. Liquids, gelatine capsules, and uncoated tablets are usually better and well absorbed. Ensuring patients with an ileostomy receive their medication in a form they can absorb is of importance to every stoma care nurse. Prescribing for patients with a stoma calls for special care. 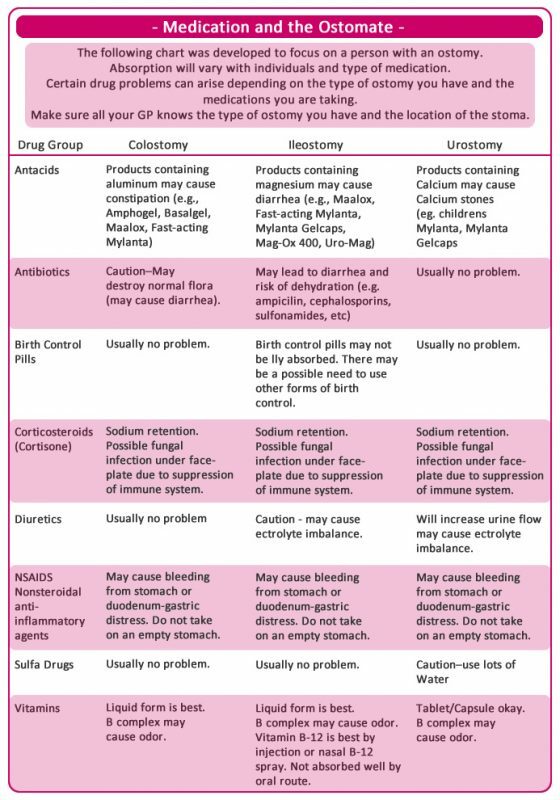 Each patient with an ileostomy requires assessment of their medication regimen for the purpose of identifying potential medical absorption issues. Dosage forms such as enteric coated and sustained release products should be avoided due to the possibility of poor absorption. Enteric coating is designed to prevent stomach lining irritation from direct contact with certain drugs, such as aspirin. Sustained release products are designed so that a small, sustained amount of medication is released along the small intestine over time. If a drug can be crushed, opened or mixed with water or if there is an alternative formulation, this is preferred for those patients with a compromised digestive system. Preference should be given to dispersible formulations if they are available, but formulations such as liquids, capsules and uncoated tablets are likely to be better absorbed. If a solid dose form is to be altered, there is a potential for its tolerability or efficacy to change. Consulting the product information or seeking advice from a pharmacist or medicines information service is recommended. However, in some situations an alternative route of administration such as transdermal, sublingual or parenteral (IM, IV or SC) may be preferred. For example, there are effective alternatives to the oral contraceptive pill, and transdermal opioids such as Fentanyl patches can be used instead of sustained-release Oxycodone or Morphine. This handy infographic from Stomawise highlights medications and the effects on the stoma. Most patients can be managed with simple measures such as selecting the appropriate formulation and dose of a drug and monitoring the outcomes of therapy. It is important for co-management with an experienced Gastroenterologist, preferably in the multidisciplinary environment, to ensure continuation of care with ongoing digestive diseases. For my Crohn’s disease I’ve taken steroids for most of the flare ups I’ve had, and always on each hospital admission. Since my ostomy surgery, I’ve had steroids on discharge – which was tapered off over six weeks whilst I recovered and prepared to go back onto Vedolizumab and then again, a year later for a flare up. I’d never considered what effect having an ostomy would have on my ability to take and absorb my medications. Not until I received gastro-resistant antibiotics for a wound infection two weeks after my surgery; I found the tablets in my bag, still whole after about 4 hours. We quickly figured this out and got my GP to reissue a prescription for liquid antibiotics! Since then, I’ve wondered more and more about absorption and how quickly my transit is now I have no colon and 30cm less of my small bowel from my previous resection. I’ve always asked for gastro-resistant tablets or requested liquid forms of some medications to help aid my absorption. This was true for the infections I’ve had this year and indeed for my pain relief; my Tramadol is SR – slow release – and lasts for a full 12 hours before warning off. My last treatment of steroids went from September to November 2017 and whilst I received my regular Prednisone, I found that my transit allowed for absorption whilst also starting Vedolziumab. I ran a Twitter poll for this post, the results can be found here. Have you experienced any medication absorption issues since having a stoma? How do you combat these? Previous Post What are the Early Warning Signs of an IBD Flare Up?